I don't know if it was the bright packaging or intriguing names of these masques that piqued my interest. 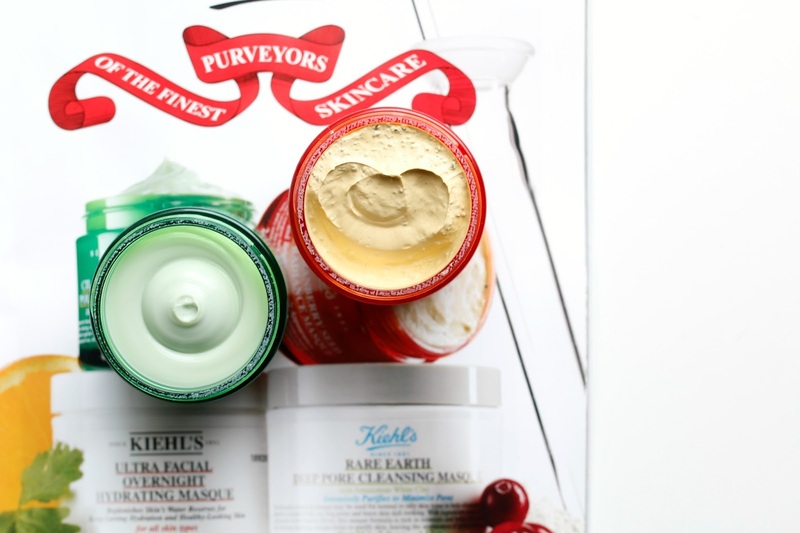 I have been a long time Kiehl's fan (this cream is a holy grail), and find their products to be effective yet still affordable. I used to get quite overwhelmed by their selection, but I ended up working for them about 8-9 years ago for a short time so it gave me a better understanding of all their ranges. They release quite a number of new products every year, and while not every single launch draws me in, these two masques most certainly did. 1. Kiehl's Turmeric & Cranberry Seed Energizing Radiance Masque - I had a feeling I would love the Pollutant Purifying Masque immediately, but had reservations about this one because it had larger seed particles in it which can sometimes be irritating to my skin. Thankfully I didn't let that deter me because I was obsessed with this masque from first use! The name could not be more accurate since my skin looked immediately more radiant and energized after. As soon as I applied the masque, it had a cooling effect and my skin felt instantly revitalized. I left it on for 10 minutes, and then removed it with a warm cloth because it hardens on the skin. FYI, it can be a bit stubborn to remove so a cloth is necessary. The seeds were not a problem and did not cause any irritation and when I went to look at my skin in the mirror - it was shocking how bright, clear and fresh it appeared! In fact, the huge (and quite painful) cystic blemish I had on my chin was less red and smaller by the next morning. For those fighting with dull and tired skin, this is a great option for a quick pick-me-up. 2. 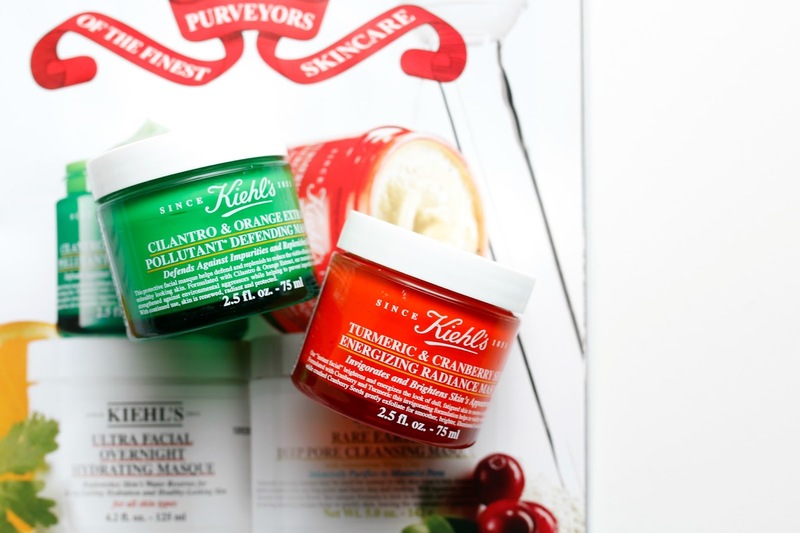 Kiehl's Cilantro & Orange Extract Pollutant Purifying Masque - Both of these masques are intensely aromatic - with this one being the strongest. While the Tumeric & Cranberry Seed masque feels very invigorating on the skin, it is the scent in this one that really refreshes me. It's a bit different than a traditional minty aroma, but one that I did not mind. The texture looks like a paste from the above picture, but when you touch it it has a slippery gel feel. It is designed to be used as a last step at night, applied for 5-10 minutes and then removed with a tissue patting in the remaining product into the skin. I preferred using it as a traditional mask halfway through my routine and then continuing with the rest of my products (typically serum and moisturizer). The effect was not as immediate with this masque as it was with the Energizing Radiance one, but after using 3x a week for two weeks straight, I did notice that my skin looked less congested and felt nicely hydrated after each use. At this price point, it's a nice masque to add into your routine if you want an added boost of hydration and something to help detoxify the skin.